This from a tipster: So two long-term KTBS employees have left the bldg in the past couple weeks. A prodn mgr with 30+ yrs barely in his 50's "resigned" and the art director who had been there for 15 yrs was shown the door last Friday. All this in the wake of their new Red News set that has received quite a few negative notes of late. On air the casts have had tech issues out-the-wazoo. KSLA's evening news ratings are number 1 (again). Seems like the folks at 3 are just tripping over themselves with smoke & mirrors. More cuts or so-called "resignations" on the way....just watch! 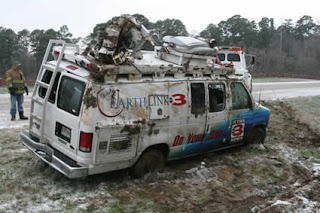 A KTBS LIVE van was involved in a rollover in last week's ice/snow storm. The Shelby County Today reports the accident happened on US 96 heading towards Center, Texas. The driver was transported to the hospital. In watching more of the Shreveport stations as of late I've noticed KSLA and KTAL making their anchors stand up while delivering the news. KTBS started this when they built its new HD set...but come on, just because KTBS anchors stand doesn't mean they all have to now. It's still ok to sit. Brad Ginsberg joins 40/29 News as Assistant News Director. Ginsberg comes to KHBS/KHOG-TV from the Hearst Television CBS affiliate, WLKY-TV where he served as Executive Producer & Digital Executive Producer in Louisville , Kentucky since 2005. Ginsberg led the station’s transition to advanced newsgathering technology. He also coordinated the station’s annual coverage of the Kentucky Derby, and March Madness. Before coming to WLKY, Ginsberg served as the Executive Producer at WINK-TV in Fort Myers , Florida . He worked his way up to that news management position, after starting as a newscast producer. Ginsberg attended the University of Texas-Pan American in Edinburg , Texas and later began his career at nearby KGBT-TV in Harlingen . “His experience both in newscast producing and immediate, online and mobile news delivery will be a great asset to the way we serve news consumers in Fort Smith and Northwest Arkansas ,” said Dawn R. Dugle, KHBS/KHOG-TV News Director. Dugle added, “Brad’s news sensibility and his experience leading live, local and late breaking news coverage in Louisville are an ideal match for 40/29.” “To identify someone with Brad’s expertise for this important leadership position puts our daily news gathering efforts across all platforms on solid footing for years to come,” said Brian Sather, KHBS/KHOG-TV President and General Manager. Arkansas Business.com reports long time KATV News Director Randy Dixon is leaving the station. Dixon has been with Channel 7 for 31 years. AB.com says Dixon plans to start his own production company. This is just the latest of resignations at KATV. Last week AB.com reported the Assistant News Director and Chief Engineer at the ABC affiliate will also be leaving the station.